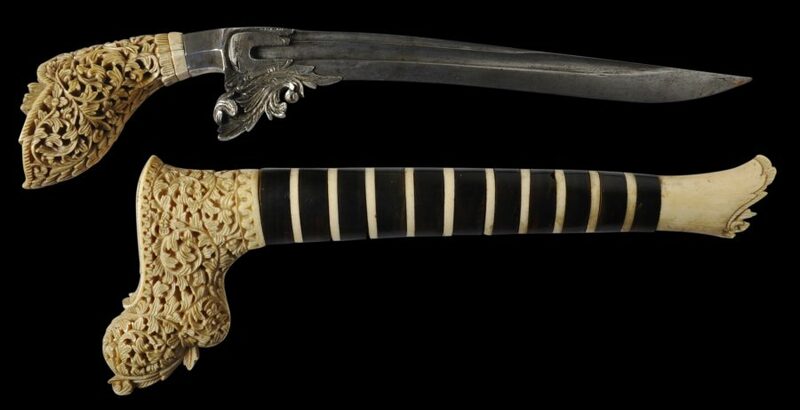 This spectacular, rare Sumatran dagger is of the highest quality and most probably was commissioned by a local sultan as a presentation gift. A similar example published in Brinkgreve & Sulistianingsih (2009, p. 127) and in the National Museum in Jakarta was a gift from the Sultan of Deli, North Sumatra, to the Dutch Governor-General and is dated to before 1877. Hales (2103, p. 203) says that work such as that shown on this dagger is associated with the Sultanate of Asahan, a Malay sultanate located on the coast south of Deli (now known as Medan). The example here has a single-edged steel blade. The ricasso is covered in high-grade sheet silver, engraved and shaped as a leafy flourish. 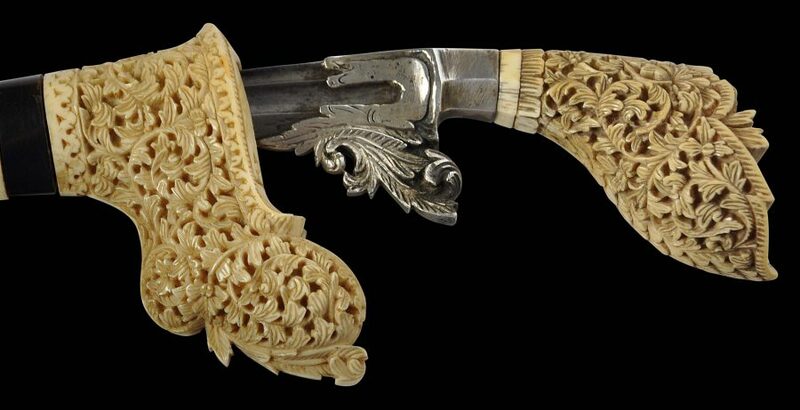 The hilt is of ivory and deeply and intricately carved with Islamic-Malay inspired leafy scrollwork. The hand guard is similarly work. 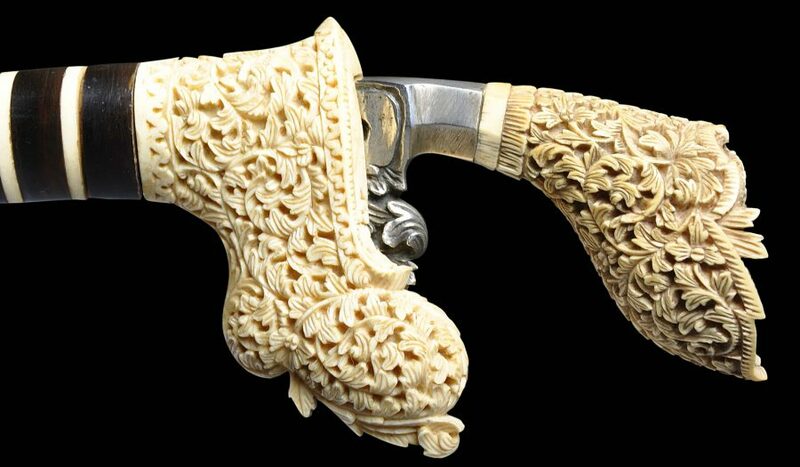 The chape is also of ivory and is carved with some additional leaf scrollwork. 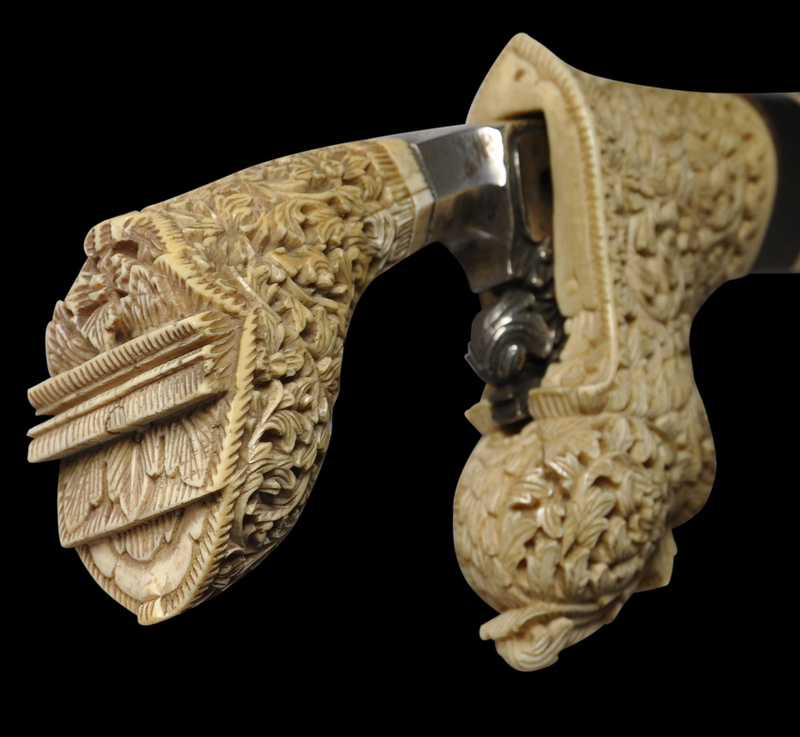 The scabbard comprises rings of dark horn interspersed with fine rings of ivory. This form of dagger became known as a tumbok lada – ‘tumbok’ means ‘to crush’ and ‘lada’ means ‘pepper’. The name is a reference to the shape of the hilt which resembles the pounder to crush pepper corns (Van Zonneveld, 2001, p. 149). The item is in near-perfect condition with only one barely perceptible chip to one of the horn rings around the scabbard. The dagger comes from a private collection and it is possibly a once-in-a-lifetime opportunity to acquire such a rare and beautiful example. Brinkgreve, F,. & R. Sulistianingsih (eds), Sumatra: Crossroads of Cultures, KITLV Press, 2009. Van Zonneveld, A., Traditional Weapons of the Indonesian Archipelago, C. Zwartenkot Art Books, 2001.